I've been a little obsessed with the China Glaze OMG series of holographic nail polishes recently and had to get a few for myself. The photos online looked so amazing and believe me, these do not disappoint. The effect is just like the photos. You remember those metallic, holographic snap bracelets from when we were little? It reminds me of that. In other words, deliciously fresh and yet nostalgic at the same time. How lovely. I bought the colors OMG, L8R G8R, QT from the OMG line, and Tickle My Triangle from the Kaleidoscope line. I've only tried the first two, but they are so cool that I thought I'd show you guys the swatches. I originally saw omg which made me want to buy them, but I have to say, l8r g8r hit it out of the ballpark for me. I LOVE this color! It's so wearable for being such a unique color, and this shade has the whole rainbow spectrum holo in real life. QT (which I tried on my toes) isn't quite as rainbow-like. It is more of a pink-mauve with holo mostly in a pink spectrum. Those swatches will come soon when I try them on my fingernails. 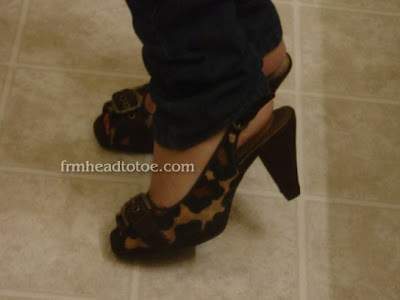 I also recently found some fantastic leopard-print slingbacks from Amazon.com. Again, they are VanEli brand. I never had VanElis before my brown spat-boots and I am so impressed with them. To find something fashionable and affordable (on sale!) in a size 4 is definitely something for me to celebrate about. Not to mention, they aren't crazy high so they are comfortable and work-wearable to boot! I have a feeling these won't leave my feet come Spring. hey, do still wear your contact lenses? i still have my solotica nc mels. 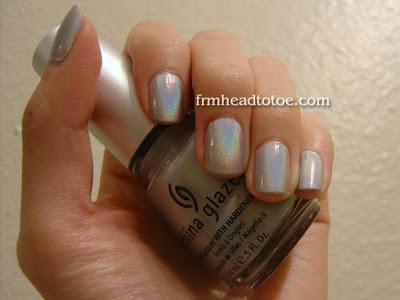 very cool China Glaze colors! i just bought the "For Audrey" Tiffany color because of one of your post. looks amazing, thanks for the tip. i looove love love the shoes ! Cutee. Jenn... you need to smile with your teeth showing! The no-teeth smile is so bland and boring.